There was jubilation in Enugu on Monday as Governor Ifeanyi Ugwuanyi flagged off the construction of the second phase of the all-important Nike Lake-Harmony Estate-Adoration Ministry- Emene road in Enugu East Local Government Area, linking the ever-busy Nike Road and Emene. The second phase of the road, which will serve as a bypass from Nike Lake junction to Emene, was approved by the State Executive Council (EXCO) a few weeks before the just concluded general election, after the first phase – construction of five River crossings including culverts and bridges of various sizes, to connect Harmony Estate with the Adoration Ministry Enugu Nigeria (AMEN) Ground, reached 85 percent completion. Flagging off the road amid jubilation and excitement from the residents, Gov. Ugwuanyi, who was accompanied by the Chief Judge of the State, Hon. Justice Priscilla Ngozi Emehelu, the Chairman of the Council, Hon. Alex Ugwu, the House of Representatives Member-elect, Hon. Prince Cornelius Nnaji, and the Commissioner for Works and Infrastructure, Engr. Greg Nnaji, among others, stated that the project, which was being constructed for the first time in the history of Enugu State, will help to ease traffic movement in Enugu metropolis and beyond. The governor added that the road construction was in line with his administration’s urban and rural development polices “to provide access to the communities in this area and ensure the full development of the Harmony Housing Estate as well as the surrounding environment”. He disclosed that 3 kilometers of the 10.5 kilometers road stretching from Emene to the Adoration Ground has already been completed and inaugurated by his administration, stressing that the state government decided to commence the construction of the second phase of 2 kilometers because of the socio-economic importance of the road to the people of the state. 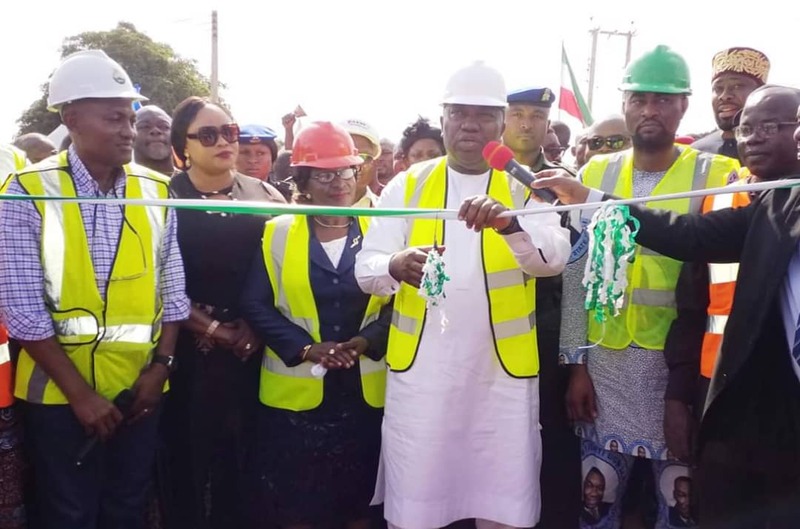 “There is no doubt that when completed, the road will not only bring much-desired relief to the residents and road users in this area but will also engender a significant boost in the socio-economic activities in the area and its environs”, the governor said. Gov. Ugwuanyi commended the host communities, residents, leaders and stakeholders in Enugu East LGA for their patience and support for the project as well as their overwhelming support during the general election. He reassured the people of the state of his administration’s “unwavering commitment to entrenching good governance in Enugu State and to the realization of our desire to take visible and sustainable development to all corners of the state”. Earlier, the Council Chairman, Hon. Ugwu, the House of Representatives Member-elect, Hon. Nnaji, the Community Leader, Chief Francis Anike, President-General, Nike Federated Town Union, High Chief Thomas Nnamene, among others, expressed gratitude to Gov. Ugwuanyi for the numerous development projects his administration has executed in the area since its inception as well as favourbale considerations in appointments. They pointed out that the governor, through his administration’s people and grassroots-oriented programmes, has touched lives positively, stating that the road will benefit not only their people but the entire country. The people reassured the governor of their unflinching support and cooperation and prayed for God’s abundant blessings and protection on him and his family as he strives to render selfless service to the state.